A four-year effort to choose a developer for a vacant parcel along the Rose Fitzgerald Kennedy Greenway in Boston is finally nearing the finish line. Two developers sought to close the deal for Parcel 9 Wednesday night, each proposing to enliven the parcel at Hanover and Blackstone streets with striking buildings, a ground-floor market, restaurants, and refurbished space for the weekend Haymarket produce vendors. The Massachusetts Department of Transportation, which owns the property, is planning to select a winning bidder within weeks. Public comments are due by April 4. There is plenty of variation between the two competitors, but the primary difference is above street level: One development team, Haymarket Square, is proposing a 180-room hotel, and the other, Blackstone Market, would build a 70-unit apartment building. The winning team will be part of a sweeping remake of the Haymarket area­ and the state-owned properties around Blackstone Street, where officials want to create a food-market district with indoor and outdoor vendors, restaurants, and specialty food shops. At the center of that market district is Parcel 9, a triangular sliver between Hanover and North streets. It is next to a state-owned parking garage where a year-round indoor farmers market is slated to go. 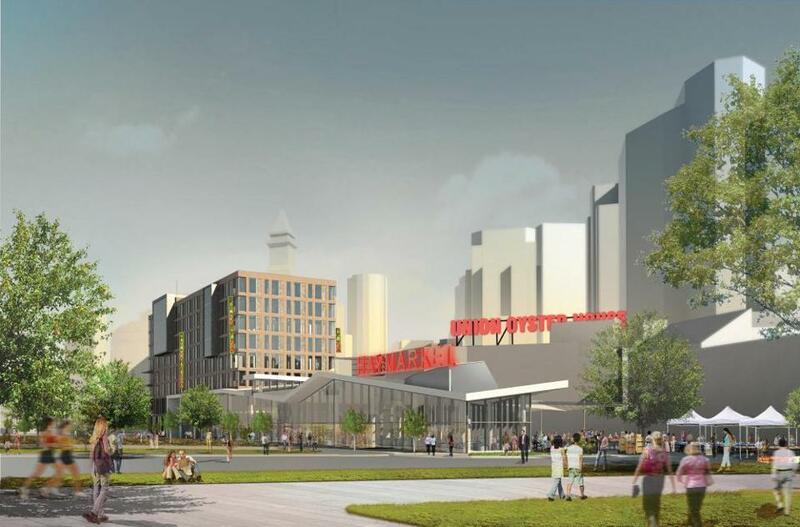 That venue, by the Boston Public Market Association, would feature products from farms and other food purveyors around Massachusetts and could be open by next year. On Parcel 9, each team is proposing a ground-floor food business that would complement the indoor public market next door, as well as a mix of restaurants, improvements to Blackstone Street, and new facilities for the pushcart vendors. The Blackstone Market team would anchor the project with a 10-story apartment building at Surface Road and North Street that would include the 70 apartments. Designed by the architecture firm Utile Inc., the building would have a food market at ground level that would sell supermarket staples. The complex would also include up to three second-floor restaurants, new trash and recycling facilities for the weekend pushcart vendors, and a community center for public meetings and special events. The Blackstone team includes DeNormadie Cos. and Cresset Group, which developed the popular Liberty Wharf restaurant and office complex in the Innovation District in South Boston. The other proposal, from Haymarket Square, calls for an eight-story, 180-room hotel at Surface Road and North Street. The developers said Wednesday that the hotel would offer mid-priced accommodations, along with a community room, fitness center, and pool that would be open to the public. The project, designed by Perkins + Will, would also include a restaurant, a ground-level market selling specialty foods, and updated facilities for pushcart vendors. The project team includes the commercial real estate firm Jones Lang LaSalle and Normandy Real Estate Partners, which developed the nearby Ames Hotel. State officials have said they expect to select a winning proposal within two months. Before construction can begin, the winner must get approvals from the Boston Redevelopment Authority and other city agencies.